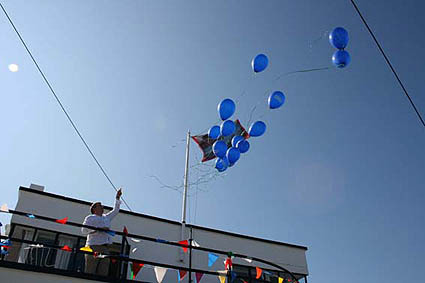 Herron will be performing a new piece at O Dreamland entitled 'Between 53 and 56 blue balloons released over a period of 10-12 minutes, or thereabouts, during the weekend of August 25 and 26 2007 (in memory of Lindsay Andersen, John Fletcher, Derek Jarman, Cliff Richard, Karel Reisz, Tony Richardson, Lorenza Mazzetti, Jack Waller, Delaine & Damian Le Bas, Ruth Calland, Lucy Harrison, Stella Vine, Jake Clark, Rebecca Gould, Natalie Dive, Russell Herron, Cathy Lomax, Sarah Doyle, Sophie MacCorquodale, Alex Michon, Gary O'Connor, The Caravan Gallery, Matthew Rowe, Annabel Tilley, Jonathan Waller, Rachel Potts, Karen & Paul Rennie)'. 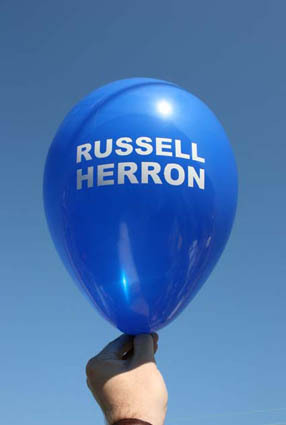 Russell Herron spent the 90s working under the name/logo/brand 'SR', producing bits of art as stickers, flyers, magazines, carrier bags and print adverts. He has written a cult online diary of private views at London galleries, collects blank pages from fashion magazines, has exhibited his own name as art and exhibits magazine covers as part of his 'Short History of Looking and Being Looked at'.